In October Geoff and I had the chance to visit Pastor Daniel’s family, meet the boys, and see how everything was going. This was Geoff’s first time in India. We had a fantastic time and saw what a great job Israel and all the others were doing looking after the boys. 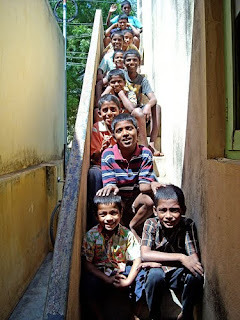 However the situation of the boys living at the church was difficult for everyone and when we got back to Australia, we started thinking about what we could do to help our Indian friends build Shalom Home. The following photos were taken during our visit in October 2008. 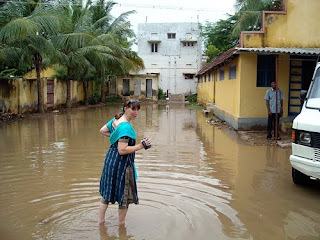 There had been heavy rain during the night and when we went to visit the boys at the church, we had to wade through a huge puddle. 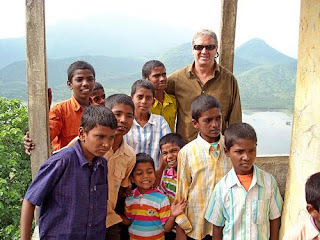 Towards the end of our visit we joined the boys on a day trip to Kodaikanal, one of the hill stations in the mountains. We visited lookouts and waterfalls, played cricket in the forest, toured the botanical gardens and went for a boat ride. 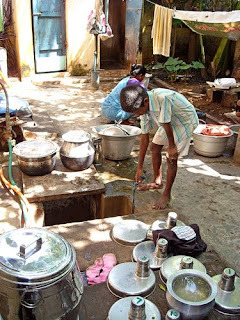 Fetching water from the underground tank at the back of Pastor Daniels house. Serving lunch in the back garden. The boys sitting on the stairs. 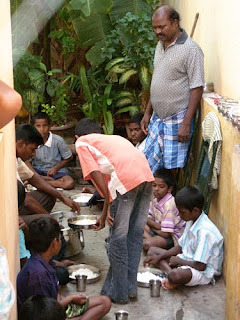 You can watch a short video of our trip and plans to build Shalom Home by clicking on the Shalom Promo 2008 at right.